Hit the gas and maneuver your way through the unpredictable terrain. Scroll-control will guide you, but you need biker instincts and lightening fast reflexes for this type of wicked landscape. Hit the gas and maneuver your way through the unpredictable terrain. Scroll-control will guide you, but you need biker instincts and lightening fast reflexes for this type of wicked landscape. The continually changing geography is sure to upend the struggling novice. Ride roughshod over cars and trucks and then plummet down narrow descents. 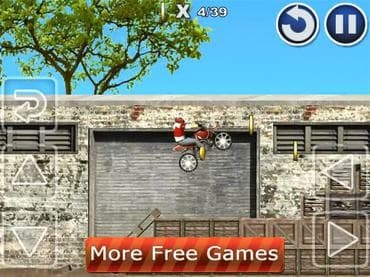 Pull flips over boulder jumps and explore the different tiers that exist on each motocross level. Collect as many gold coins as you can to increase your score. Perfect styled graphics and gameplay make this one motocross journey you will never forget. If you think you've got what it takes, then play this free game today. If you have questions about Bike Extreme game, please contact us using this form.